We can't just sit on the beach all day, can we? Well, with our butler bringing us drinks and snacks and doing everything for us short of wiping our asses, we most definitely CAN sit on the beach all day. That's why we book a night time excursion to swim in the glistening waters of the famous Luminous Lagoon. Montego Bay's luminous lagoon is a shallow lagoon of brackish water that is a habitat to a unique species of dinoflagellate. These phytoplankton emit a bioluminescencent blue-green glow when disturbed by people swimming or by boat engines cutting through the water. We booked our excursion through the Sandals desk so all we had to do was wait outside at the appointed time and a car came around to pick us up. We traveled for about 20 minutes before reaching a somewhat seedy hotel/bar where we were invited to have a complimentary drink. We declined. I started to wonder about the possibility of waking up in a bathtub with a kidney missing. We waited for everyone else to arrive while a small dance troupe danced on stage. After about another 20 minutes of waiting, we all crowded into a boat and set off into the middle of the lagoon. Along the way, the driver explained to us how the bioluminesence worked. We were able to see the blue-green glow being emitted behind the outboard motor. We were soon encouraged to jump into the water to experience the glow of the luminous lagoon for ourselves. Sounds cool, right? 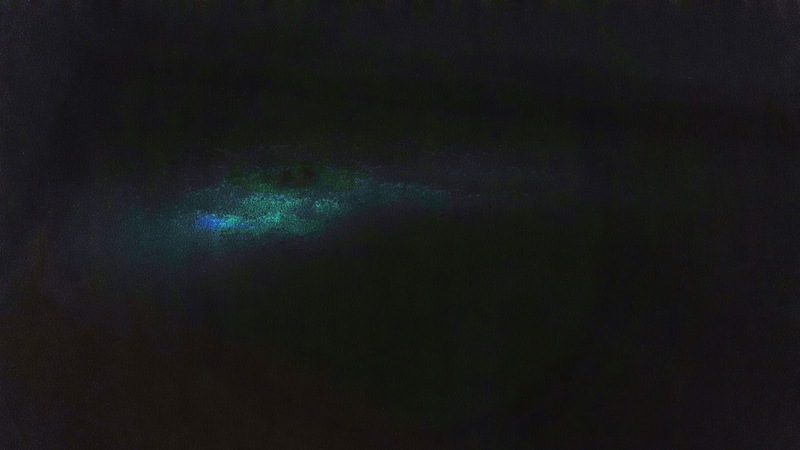 Well, I'm thinking that the phytoplankton weren't feeling to luminous tonight because we could see nary a glow when we jumped into the water. It made me wonder for a moment if perhaps the boat's motor had some sort of tank containing glowing paint. The temperature of the water was pretty cold which may have had something to do with the general lack of glowing activity. Everyone was pretty disappointed at the coldness of the water, the muddiness of the bottom of the lagoon and the overall lack of activity. And, at $60 a person, I can't blame them. Then there's the camera guy. He's happy to take pictures of you splashing about in the lagoon and then sell you the photos for $25. The best he could do for us was to have us sit near the motor while it was running while he took a series of pics. Not much came of him shooting pictures of people while they were in the water.